This pattern can be easily adapted for larger sizes! Just cast on more stitches and work the yoke untill if fits you. You might have to work in bust darts. Continue untill it’s long enough(you can try it on by placing the stitches on waste yarn) and place sleeve stitches on waste yarn. Join body stitches on circular needles and knit in stockinette untill just under bust. Begin knitting in lace pattern, you might have to increase/decrease before starting(remember the pattern is a 8 stitch repeat, so you need a multiple of 8 stitches on the needle!). 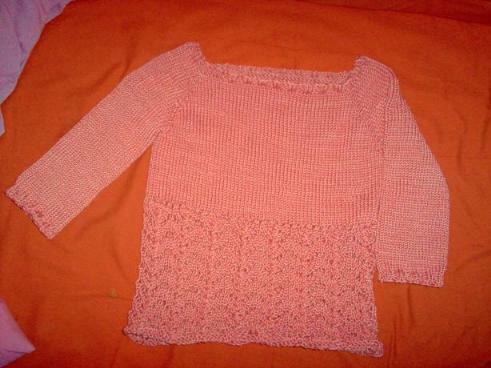 Knit in pattern till desired length, then knit next three rows in garter beginning with a knit row. Transfer sleeve stitches from waste yarn unto needles. 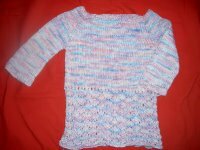 Start knitting sleeves in stockinette untill desired length is reached. repeat as for left sleeve. Change color every three rounds. the pattern is a 8 stitch repeat, so you need a multiple of 8 stitches on the needle!). Original pattern and photographs © 2006 Janin Den. Yay! You wrote up patterns, good girl!